In ‘Step 4 - Profiting From Free Bets’ we said that you will make between £9 to £15 from a £20 free bet, depending on the odds you choose. Here is a table from the Coral offer showing this. As you can see from the above table, if we choose odds of 2.0, our £20 free bet converts to £9 cash, which is 45% conversion from free bet to cash. 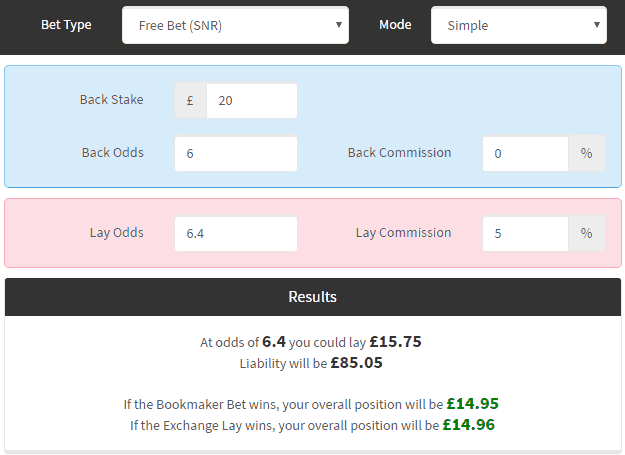 Whereas if we choose odds of 6.0, our £20 free bet converts to £15 cash, which is a 75% conversion from free bet to cash. In this optional article, we explain the why higher odds means higher profit and run through an example. Why Higher Odds = Higher Profit? If our £20 free bet wins, we do not receive the £20 stake back as part of our winnings. Therefore, by betting on a dead cert, we are limiting our winnings to a small amount given our £20 stake is not returned. Whereas if we bet on team with high odds that could make us £100+, we can make a big profit as our £20 stake is quite small in comparison to our winnings. The only consideration with high odds, is it requires a higher liability in Betfair Exchange. Gimme an example with low odds! This shows us by using odds of 1.95 our guarantee profit is £9.30 from our £20 free bet. On the plus side we only need £9.69 in our Betfair account, being the liability. Great that I make £9.30, but where actually is my profit? If England win, we win our Coral free bet for £19 winnings, but lose our Betfair £9.69 liability. This give us a net profit of £9.31. If England do not win (draw or Russia win), we lose our Coral free bet (costs us nothing), but win our Betfair £9.79 lay bet. Deducting the 5% commission, this gives us a net profit of £9.30. Gimme an example with high odds! We can enter these 3 numbers (£20, 6, 6.4) into the Calculator, remembering to use ‘Free Bet SNR’ in the dropdown. This shows us by using odds of 6.0 our guarantee profit is now £14.95 from our £20 free bet. Just be wary that we need £85.05 in our Betfair account, being the liability. Even better that I make £14.95, but where actually is my profit? If Ukraine win, we win our Coral free bet for £100 winnings, but lose our Betfair £85.05 liability. This give us a net profit of £14.95. If Ukraine do not win (draw or Germany win), we lose our Coral free bet (costs us nothing), but win our Betfair £15.75 lay bet. Deducting the 5% commission, this gives us net profit of £14.96.